A filter is a device in signal processing used to allow wanted frequency components from the signals and to remove unwanted ones. The background noise of the interfacing signal can be reduced by eliminating some frequencies, which is known as filtering. Filter circuits can be designed to combine the properties of the LPF (low pass filter) and HPF (high pass filter) into a single filter, which is known as a bandpass filter. This filter can be created by combining a low pass filter and a high pass filter. The different types of filters include active or passive, time variant or time invariant, linearity-linear or non-linear, analog or digital, and so on. Here, in this article let us discuss about a bandpass filter, its types and applications. What is a Bandpass Filter? A bandpass filter (BPF) is an electronic circuit that allows signals between two precise frequencies to pass, but separates signals at other frequencies. Some BPFs are involved in an external power source and utilize active components like transistors and ICs (integrated circuits); these are known as active bandpass filters. Other types of BPFs don’t use any power source and use only passive components like inductors and capacitors; these are known as passive bandpass filters. Bandpass filters are mainly involve in wireless transmitters and wireless receivers. The main objective of this filter in a transmitter is to limit the bandwidth of the o/p signal to the minimum required level and to convey data at the preferred speed and in the preferred form. In a receiver, a BPF (bandpass filter) allows signals within a preferred range of frequencies to be decoded, while avoiding signals at redundant frequencies from getting through. A BPF also optimizes the S/N ratio (signal to noise) of a receiver. Band pass filters pass signals with a certain band of frequencies without deforming the i/p signal. The band of frequencies can be very wide and it is normally known as the filter’s bandwidth. The term bandwidth can be defined as the range of frequency that exists between two particular cutoff frequency points (fc). For widespread frequencies, bandwidth can be defined as, the difference between the lower cutoff frequency and the higher cutoff frequency points (BW = fH-fL ). The cutoff frequency of the LPF must be higher than the cutoff frequency of the HPF for the proper working of the pass band filter. An ideal bandpass filter can also be used to filter out or isolate certain frequencies that recline in a specific band of frequencies. For instance, BPFs are known as second-order filters because they have two reactive components. The circuit diagram of the bandpass filter is built with the capacitors by placing one capacitor in the LPF (low pass filter ) circuit and the other capacitor in the HPF (high pass filter) circuit. Bandpass filters are categorized into two types: wide bandpass filter and narrow bandpass filter. A wide bandpass filter (WBF) formed by cascading lowpass and highpass sections is generally an alternative circuit for ease of design and performance. It is realized by a number of feasible circuits. A ± 20 db/ decade bandpass filter formed by a first-order low-pass and high-pass sections can be cascaded. In the same way, a ± 40 db/decade bandpass filter can be formed by connecting a second-order low-pass and high- pass filter in series. Which means, the order of the BPF (bandpass filter) is governed by the order of the low-pass and high-pass filters it has. 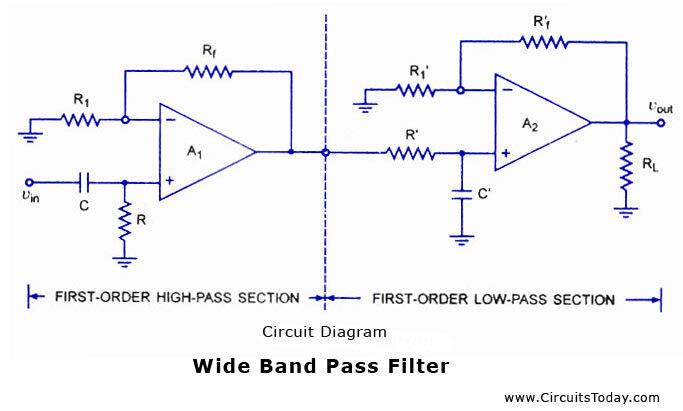 A ± 20 db/decade wide bandpass filter is composed of a first-order high-pass filter (HPF). A first-order low-pass filter (LPF) is shown in the below figure with its wide bandpass filter frequency response. A narrow bandpass filter employs multiple feedback and this filter uses only one operational amplifier as shown in the figure. Narrow bandpass filter has some unique features compared to all the other filters discussed below. Narrow bandpass filter is named as a multiple-feedback filter as it consists of two feedback paths. The operational amplifier is used in the inverting mode. The frequency response of a narrow bandpass filter is shown in the below figure. Generally, the narrow bandpass filter (BPF) is designed for precise values of fc (center frequency) and Q or center frequency and BW. The required components of the circuit are determined from the following relation­ships. Each of the C1 & C2 can be taken equal to C for design calculation simplifications. However, the gain Af must satisfy the following condition. BPFs (Bandpass filters) are extensively used in wireless transmitters and receivers. The main function of this filter in a transmitter is to limit the bandwidth of the o/p signal to the band allotted for the transmission. This avoids the transmitter from interfering with further stations. In a receiver, a bandpass filter allows signals within a selected range of frequencies to be heard or decoded, while preventing signals at unwanted frequencies from getting through. A bandpass filter also optimizes the signal-to-noise ratio and sensitivity of a receiver. Bandpass filters are used in all types of instruments as well as in Sonar, Seismology and even medical applications like EEGs and Electrocardiograms. These filters are also extensively used in optics like lasers, LIDARS, etc. 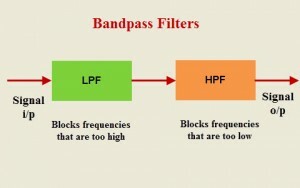 A BPF (Band Pass Filter) permits an exact frequency range to pass, while blocking frequencies that are lower and higher. A good application of a BPF is in Audio Signal Processing, where a particular range of frequencies of sound is required while removing the rest. Bandpass filters are used in communication systems for selecting a specific signal from a range of signals. Thus, this is all about a brief explanation about what is a bandpass filter, types of bandpass filters and also applications of a bandpass filter. We hope that you have got a better understanding of this concept. Furthermore, any queries regarding this concept or electrical and electronics projects, please give your feedback by commenting in the comment section below.